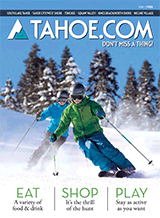 If you are looking for a hip place in South Lake Tahoe, look no further than The Social House. A chef-driven dining experience, The Social House offers a full bar and an exquisite spin on gourmet sandwiches. It's a restaurant with two faces. The daytime is a landscape of exceptional sandwich recipes, such as their Pig Out (ciabatta, mortadella, black forest ham, Italian dry salami, prosciutto, provolone, lettuce, tomato, red onion, pepperoncini, Giardinera, oil, vinegar, salt and pepper) and the Veggie (Dutch crunch roll, hummus, arugula, tomato, red onion, avocado, cucumber, black olives, roasted bell pepper, pepperoncini and champagne vinaigrette). In the evening the place shifts to a secret 1920s-style speakeasy with a smorgasbord of incredible cocktails as well as their house-made alcoholic and non-alcoholic slushies.